From simple engraved nameplates, posters, or banners to the largest illuminated structural signs and channel letters, we can design, produce or manufacture, and install your signage efficiently, timely, cost competitively, and with superior quality. Many of our custom signs require aluminum fabrication and the skills of aluminum welders. We have several of the best in the business and they will do a quality, professional job every time. Custom painting is required for most of our fabricated signs. We use Matthews Paint System. It is a catalyst (2-part) paint that has the longest outdoor life in the industry. It is the industry’s best paint. We use an extremely accurate paint mixing system to match any color in the spectrum. We also have a perfectly climate controlled paint booth for professional painting on every job. Precision Sign & Awning has the ability to produce almost any type of signage that our customers’ desire, In-House, with our very experienced employees and a wide variety of state of the art equipment. We use a HP 560 Latex Printer for our vehicle graphics, some banners & large format applications. Latex ink was developed with vehicle graphics in mind because of It allows the ink to stretch. It is also an extremely durable ink and scratch resistant; even before we laminate it for vehicle applications. 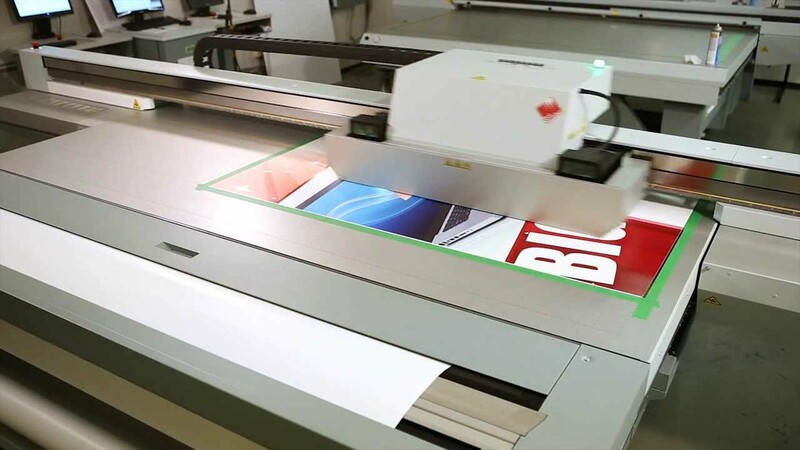 We currently have the latest-generation large format Canon Oce’ Arizona Flatbed UV printer to produce beautiful, long lasting designs on almost any material or substrate that our customers desire. For vinyl lettering applications, we use the industry leading Graphtec Plotter. Many applications are best produced with cut vinyl lettering. We have an extensive inventory and decades of experience in using the best product to give our Customers the exact combination of products to produce their project with the highest quality at a competitive price. Our UV and Latex Printers produce digital designs with long lasting outdoor life, but certain applications require additional protection for 10-year fade resistance on signs. We use the industry leading Gfp 563TH laminator & the industry’s best laminates for quality laminating to ensure long term outdoor life. Fabricated aluminum signs require exceptionally clean cuts on the aluminum for professional results. We use a 12-foot Hydraulic Shear to ensure the clean cuts required to do the job right the first time. Many of our signs require the use of our CNC router. Whether it be faces or backs for channel letters, routed letters, dimensional signs, or cutting material to shape for your specific design, a quality CNC router is required to get a high-quality product. We have the industry best AXYZ Trident router for beautiful and precise signage every time. Many malls and strip malls require the use of custom channel letters for their tenants. We produce high quality Channel Letters, Logo’s, and Graphics to your exact specifications In-House. We use our AXYZ router to cut the faces and backs and we use our Accubend Channel Letter Machine to make perfect returns. With the use of our AccuPunch machine, we can ensure perfect structural integrity of the letters 100% of the time. We have an experienced team to create any letter / logo design that our Customers’ can imagine. Our designers are very skilled in the sign business and they know which designs will look best in each of the many different types of signs that we can produce. They know when to tell you that your idea or design will not look good in a certain product. This is a valuable skill. Many graphic designers are fantastic designers but they do not understand the sign industry and the ramifications that some of their ideas might have on the look of a finished sign. Precision Sign does not charge extra for design work, and we can help you achieve the exact look you are seeking for your Signage using years of experience to avoid the pitfalls of inappropriate design or layout. Whatever you can imagine for your project, we can produce it to your specifications at a reasonable cost and in the timeframe that we promise you. We look forward to the opportunity to serve you.